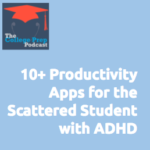 Smartphone apps can be a great support, but also an annoying distraction, for students, especially those suffering from ADHD. Gretchen provides a list of 10+ apps and suggestions for how to use them so that students maximize productivity and minimize distractions. Tune into Gretchen’s podcast and learn more about these apps by clicking here.